ENVY, a Windows NT-based router control system, provides a quick and efficient method to control NVISION routers and to interface with routing equipment of other manufacturers. 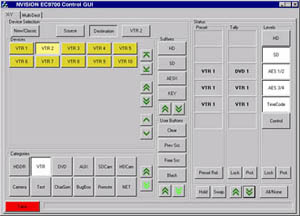 The system features GUIs for configuration database and router control, easily expandable system components, configurable control panels, error logging, and diagnostics. ENVY includes two types of control panels. The NV9601 is an X-Y/multiple destination panel and the NV9602 is a programmable button per function panel. NVISION, Inc., 125 Crown Point Court, Grass Valley, CA 95959. Tel: 530-265-1000; Fax: 530-265-1021.